After my little dabble with artistic designs in the last post with the Snowes on the stairs, I've gotten a bit of a more creative bug. 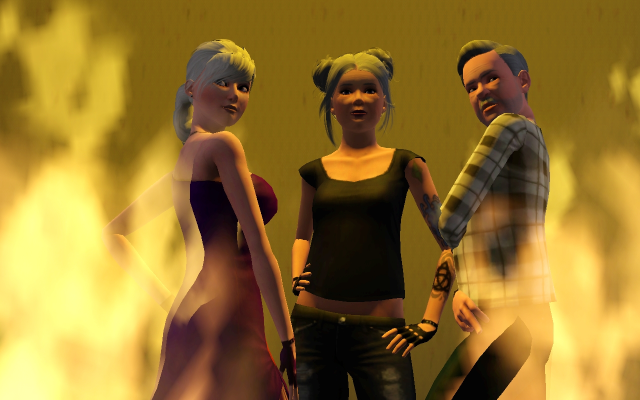 Who better to start that with than the three sims who founded this "quirky" family? Are you a Chelicia shipper? These three are totally epic. Alicia the alcoholic tattooed party girl, who wasn't satisfied with living one life; she lived three. Mattie the devoted mother, even in death. Chester the man of very few words. Let's face it, these three are epic. And, luminations ( lumy12 in case you use this journal first. ^_^ ) , you wanted a one true three, well, you got it. These aren't exactly passionate. ('Cause let's face it this is Chester "functional mute" Snowe we're talking about.) Sadly, not all three of them getting romantic together at the same time. Not a lot of polyamory poses out there. I hope you like them. LOL so I just had to comment with BOTH journals! The more I see Matilda, the more I love her! I'm a Chelicia shipper but I got to say, Matilda has a special place in my heart. The special effects in the pictures were a nice touch! Mpart: Thanks! :D I had so much fun with those special effects. They might look like they're edited, but they're really not! :O It's the party effects machines. I don't know if anyone does like OT3 as much as you, but I took them for you anyways. ^_^ So if they don't like them, they don't have to look at them.